* A note about terminology: Technically, English Regency court gowns were a really odd silhouette where you had the high waist but very wide shape, and French gowns of the Napoleonic period had the more columnar shape, so my whole outfit is French style. However, for simplicity in some of my past posts I have been using the term “Regency” because I can wear my gown without the formal court train. I love this view of the back. Thanks Mr. Schmidt for making sure the circle was laid out nicely! 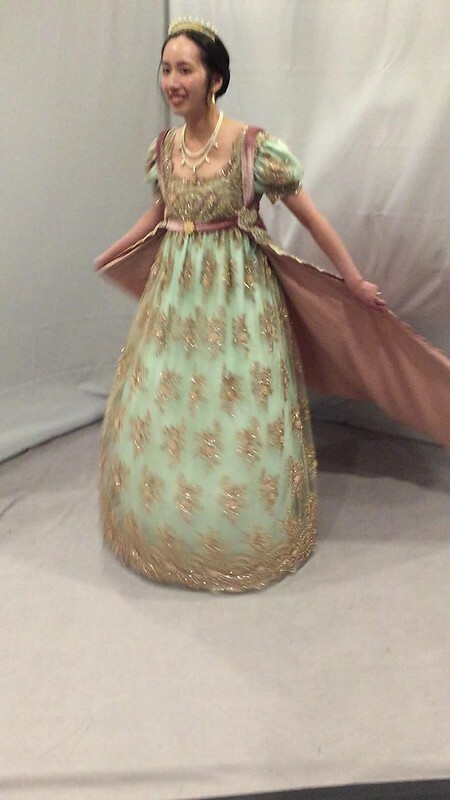 I have made a number of posts about the construction process of the dress and train and you can find them under the Napoleonic tag on my blog, but I will summarize a few main points here. For the court train I used the Butterick B4890 Josephine pattern, but I modified it to have straps instead of a bodice back. The train is made with silk velvet, lined with a linen/cotton blend, and edged in a gold-tone netting lace. The front underbust strap is closed with a vintage brooch that I found on eBay. My pearl necklace and earrings were made by Gloria of In The Long Run Designs, whose Etsy shop is full of beautiful historical jewelry! My regency diadem was made by me using brass lamp banding and faux pearls. (I posted about a party where I made some other diadems here). This whole outfit was really heavy and became quite uncomfortable to wear by the end of the evening! I’m glad it was worn for only a few hours at the Friday Night Social. The dress is heavily beaded and sequined, and the train is quite heavy too, and unlike a Victorian outfit where I can have a corset and hoops to help support the weight, everything was supported by my shoulders. Here’s a quick twirling video here where you can see the dress sparkle! So, what’s the final tally of what everything cost? This was my “splurge” project for the year so it cost more than my usual outfits, but I think this one was worth it! Ouch, that’s a bit of a splurge, but it’s not terrible considering I have a lot of huge scraps of silk velvet left over, and can probably make a 1920s dress with some careful cutting, so I can get two dresses out of that price! Tiara: The cost of this is a little tricky to calculate, because a lot of the supplies I bought in bulk, used to make other tiaras, and shared with friends. I think if you shop right and share with friends you can make one for $30 depending on how fancy you get with beads, pearls, or gemstones. A big part of the cost is buying the brass online and paying for shipping. My shoes were Pemberly Regency slippers from American Duchess (affiliate link) that I previously owned. I am also wearing short stays and a corded petticoat (not period correct, but needed to support the weight of the dress). So in total, this ensemble will cost you about $400 of materials (not including accessories), but represented a little more than $200 out of pocket, with enough leftovers to make a second dress, so not too bad! I try to keep most gowns $100 or less, so this was my “big project” for the year. I am very happy with how this court outfit turned out, especially how the mint and rose color combination worked together, and how the accessories completed the look. It’s also always nice too when a dress looks good from the back as well! Posted in Costume College 2017, Regency and tagged costume, Costume College, Costume College 2017, court, court dress, historical, Napoleonic, regency, sewing. Bookmark the permalink. Regency/Napoleonic Court Train (Part 2) 98% Done! My Regency/Napoleonic court train is nearly done! (I am just missing a proper brooch closure for the front; right now the straps are pinned into place). I apologize for the weird lighting. I recently changed some of the lighting in my house to LED bulbs, which is great for my energy bill but not for the color of my pictures. Don’t you just loooove the way silk velvet drapes? Here is a shot with my court dress previously described here. I hope to get proper photos of the whole ensemble at Costume College. Here is another mmm silk photo since I love the back so much. I used Butterick B4890 to get the teardrop shape, but did not use the bodice portion of the pattern. I opted for the shoulder and underbust straps I saw in extant examples of court trains. I also decided to have a more “modest” length train since I will be using this at Costume College and it will be easier to navigate the crowds. I can’t wait to wear this! I still have to make a matching regency diadem and I have a pearl jewelry set on the way. Once that’s taken care of I can finally start on my gala gown! (I will do my usual final tally of project costs once the whole ensemble is actually complete, but it is nearly there). Posted in Regency and tagged costume, court, court dress, Napoleonic, regency, silk, velvet. Bookmark the permalink. The blog has been a little quiet lately since my last post on Regency diadems because I’ve been having some issues with my wrists and haven’t done much sewing except for things I can make completely by machine, like curtains. However, I have received all my materials for my court train, to go with my beaded court dress. I have 6 yards of silk velvet, which depending on the light and the direction of the nap appears either a deep rose color or a silvery-pink. (I tried getting swatches of cotton velvet, but they were the wrong texture and stiffness and were obviously meant for upholstery). I didn’t realize before starting my search how hard it is to find a nice rose-colored velvet that isn’t either baby pink or hot pink! I would have been happy with a synthetic velvet if it was the right color, but ended up having to go over budget and buy silk. Of all the places I looked, you’ll never guess that the final winner was Amazon! After a few tries at swatches of lining I settled on a linen-cotton blend from Renaissance Fabrics. The dusty pink color is good match to the underside of the silk velvet, and lighter than the deep rose but close to the silvery-pink. (Left to right: underside of the silk, the velvet, and the lining). The lace I ordered online was a brighter gold than the stock photo (and what I was able to photograph below), but still rather pretty. However, I think bronze would be a better match to my dress, so I’m going to have to tone down the lace. I have a friend who has sponge-painted acrylic craft paint onto lace before, so I will be doing some experiments! I hope it works; after the purchase of the silk velvet I’d rather not spend any more money on this project buying new lace and crossing my fingers that it is the right color! Posted in Regency and tagged court, court dress, lace, regency, silk, train, velvet. Bookmark the permalink. The Napoleonic era is filled with gorgeous golden diadems, studded with coral, pearls, gemstones, or lovely cameos. What court outfit is complete without a tiara? This garnet diadem was sold on Ruby Lane. This coral diadem made from gilded brass from A. Brandt is very elegant. Here is a beautiful cameo tiara sold by Sotheby’s that inspired me to want my own. This parure (matching set) that belonged to Caroline Bonaparte is stunning! Last month, I hosted a group of friends and we decided to try our hand at making our own, using this great tutorial from the Mistress of Disguise, for a Regency Tiara Making Day! Behold, crafting chaos. We bought materials from a variety of places, including Michael’s, Joann’s, and eBay for beads and wire; Hobby Lobby or Amazon for brass sheets and metal combs; and Whittemore-Durgin, Etsy, and Ebay for our brass lamp banding. It’s hard to say how much it cost to make each one, since some things were bought in bulk and we did a lot of sharing. Here are our tiaras! Soldering looks better but hot glue is much faster than soldering, especially when you have a group. High-temp hot glue is required; the mini glue guns used for crafting don’t stick as well. Big tin snips instead of small jewelry snips are better for cutting through the brass banding. (Regular scissors can cut through the brass sheets). If you have tarnish on your brass, use Simichrome polish. Wiring metal combs to the diadem is more sturdy than gluing metal or plastic combs. Here are my “practice tiaras.” They are not perfectly straight and there are some little issues I’d like to work on (such as the thickness of the brass, the overall proportions, and remembering to push the head pins down before the glue set!) but they were really fun to make and I want to make more! I’d like a thinner, more delicate pearl one, and a pink coral one to go with my court gown. Posted in Regency and tagged costume, crafts, diadem, diy, regency, tiara. Bookmark the permalink. I’m still working on the rest of the court ensemble but at least my dress is complete! I didn’t have all my accessories yet at the time so I wore a pearl tiara I had instead of a Regency diadem and did a quick updo. (My next post will be about Regency diadems; I got together with a group of friends for a tiara-making day). I combined some pattern pieces to minimize seams in the beaded fabric. I skipped the gathered overlay on the bodice which is recommended for solid fabrics. I raised the back neckline about 1 inch. I extended the bottom front bodice about 1 inch since I was not trying to achieve the tiny bodice/pushup bra look. Note: Butterick B6074 runs large! It has a lot of ease built in for the modern wearer. I recommend going down 2 sizes. For undergarments I am wearing a shift, short stays, a corded petticoat and a ruffled petticoat. I normally would not wear a corded petticoat with Regency but this dress is heavy. I have decided to go with a rose velvet for the train, and I have been spending far too much time searching for pink velvets, getting swatches, and looking for trim. However, I think we have a winner. I still need to order the rest of the fabric and find the trim, but I’ve purchased lining and have the pattern ready. I’m mulling over whether I should use my leftover beads and sequins to decorate the trim, but that may be madness speaking. By the way, in case you think my life is glamorous, here’s a peek at real life (bad posture, clutter, and photobombing) vs. the cropped version of a selected few pictures for the blog! I wrote a tutorial for this dress, which Fabric Wholesale Direct spiffed and made into this post on their website! All the fabric I used for this project is from Fabric Wholesale Direct. Thank you! Posted in Regency and tagged beaded, costume, court, dress, historical, regency, sewing. Bookmark the permalink.